Love is in the air! Valentine’s Day is all about celebrating those we love in our life… those who are always there for us, who comfort and care for us and can make us feel better after a long, hard day. Does this sound like anyone you know? It should! It’s your HVAC system! 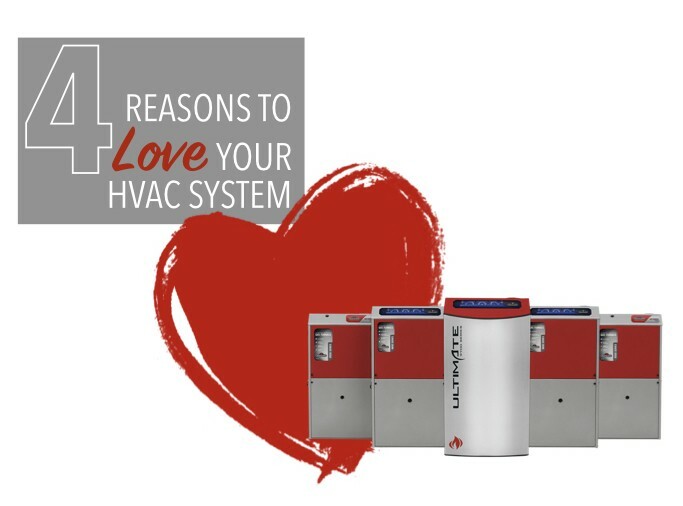 Here are four reasons why we love our HVAC system, and so should you! After this last cold snap, we are so thankful we could rely on our furnace to keep us warm and cozy in our home. Let’s not forget our AC and how cool and well-rested we are during a heat wave. A comfortable temperature in our home gives us a more productive and pleasant environment to live in. This is another shout-out to our beloved AC system for preventing us from sweating profusely and keeping Dan smelling fresh on those hot summer days. And during the winter it allows us to peel off those layers when we come inside so Dan no longer looks like the Stay Puft Marshmallow Man. 3. Saves our limbs… and our life! We rely on our home to protect us and keep us safe and out of the elements. Without our furnace we would end up with frostbite or hypothermia during the polar vortex we often experience. Our home would no longer ‘spark joy’ as the pipes would freeze and nothing could function. Alternatively, we would encounter severe dehydration and heat stroke during those hot summer days. When we’re in a heat wave, WE no longer function if we can’t stay cool. Our HVAC system reduces the amount of allergens, dust and pollen in our air and improves the overall air quality in our home. Without an air purification system attached to an HVAC system, allergies may be more severe, and sicknesses and germs can linger in the air longer. Our HVAC system provides us with clean, healthy, filtered air helping us breathe easier. There’s so many more reasons to love your HVAC system, as it works for us day and night. Can you think of anything to be more dedicated to your well-being or more deserving of your love and admiration?! Make sure you return your HVAC system’s love with continued maintenance and annual check ups! And if your HVAC system doesn’t fit this description, give us a call @ 780.919.4916 as we can help with a tune-up… or dare we say a REPLACEMENT! Happy Valentine’s Day from Ignite where your comfort is our concern! Your furnace replacement doesn’t have to be a costly, emergency decision. Here’s three things to consider when it comes to deciding if it’s time to replace your furnace. The average life of a well-maintained furnace can be as long as 15-25 years – but that means you need to maintain your furnace! Indications that you may need to call for a tune-up of your furnace include: your furnace making noise such as a rattling, distressed, scraping or high-pitched squeal, having trouble with your thermostat, dusty/dry air inside your home, and static electricity. While there is no such thing as an absolute guarantee to avoiding a furnace replacement, the benefits of annual furnace maintenance include: lower energy bills, fewer repairs, lower chance of a surprise breakdown, longer equipment life and safer equipment operation. If you haven’t been maintaining your furnace, it will likely need to be replaced earlier. You’ll want to consider whether it’s worth it to pay for current repairs or buy a new unit. If you are starting to have some issues, add up those repairs or potential repairs and you will find you could easily be spending 25-30% of the cost of a new high efficiency furnace. 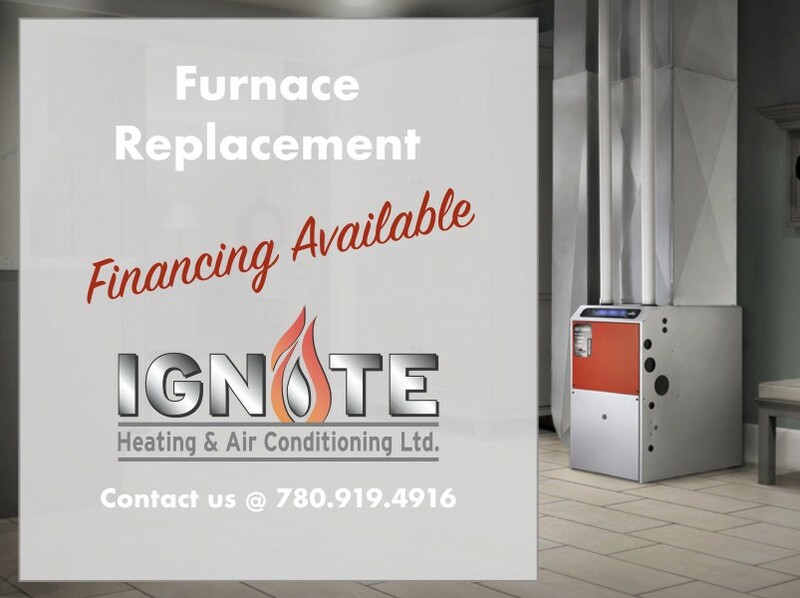 By booking an annual furnace maintenance session with Ignite we look at the overall performance of your furnace and suggest if it’s time to plan for a replacement in the next few years. The final factor to consider, is how cost-efficient it is to run your old furnace. Efficiency decreases with age – and rapidly if annual furnace maintenance has been ignored. The cost of running a newer model high-efficiency furnace compared to a 20-year-old model is quite substantial. On average if your furnace is 15-25 years old it is likely a 55%-65% efficient model – we sell 97% efficient models, which could amount to a five-year energy savings of over $5,000! As you make your decision, don’t forget the Alberta government rebate available for all installs is still in place! You can get some money back on your installs by applying with Energy Efficiency Alberta. At Ignite Heating and Air Conditioning, your comfort is our concern! We provide on-site quotes to review your existing furnace and determine the best approach for replacement. We are able to provide you with options on the furnaces we sell to ensure that the features are both cost effective and meet your heating needs. Give us a call at 780.919.4916 today! Save Money On Your Furnace Replacement!